Tottenham swept into the FA Cup fourth round as Fernando Llorente hit a hat-trick and Serge Aurier struck twice in a 7-0 rout of fourth tier minnows Tranmere on Friday. 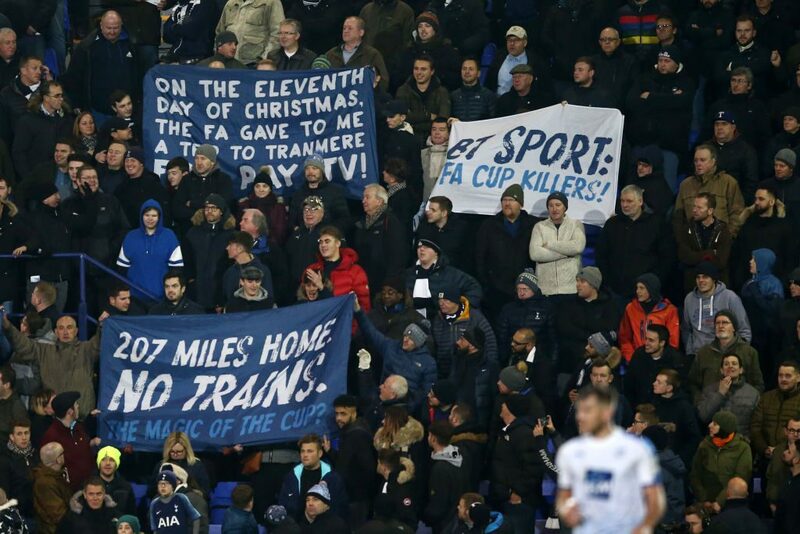 There are 74 league places between the sides and Tottenham, third in the Premier League, underlined the gulf in class as they demolished Tranmere, who sit ninth in League Two. Mauricio Pochettino’s team took control of the third round tie through Aurier’s powerful strike late in the first half and Spain forward Llorente added to their lead after the interval. Aurier netted again and South Korea winger Son Heung-Min produced a superb solo effort as the goals flowed. Llorente struck twice more to complete his treble before Harry Kane came off the bench to seal Tottenham’s biggest win since a 9-1 thrashing of Wigan in 2009. “It was a very professional performance. I’m very pleased,” Pochettino said. 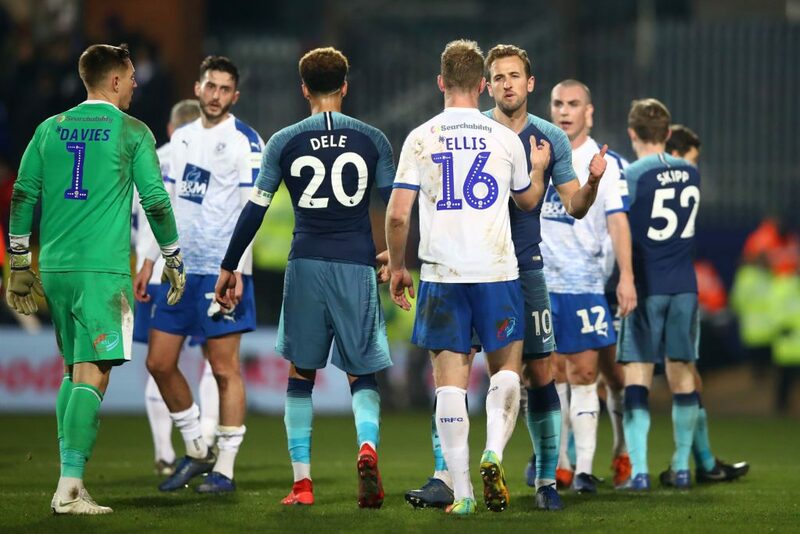 After the hectic Christmas schedule, Tottenham will be relieved their 11th game in 33 days was a stroll at Prenton Park, especially with the League Cup semi-final first leg against Chelsea looming on Tuesday. Tottenham haven’t won the FA Cup since 1991 and silverware has been in short supply ever since, with the 2008 League Cup their most recent trophy. Although Pochettino is still searching for the first prize of his four-year reign, he admits the FA Cup ranks way behind the Premier League and the Champions League on his list of priorities. With that in mind, it was no surprise to see only Son, Dele Alli and Davinson Sanchez start from the line-up that beat Cardiff on Tuesday. Tottenham finally made their extra class pay off in the 40th minute when Ivory Coast right-back Aurier smashed a swerving 25-yard strike into the top corner for his first goal of the season. There was a hint of controversy about the goal as television replays showed the ball was moving illegally when Son took the quick corner that led to Aurier’s rocket. Tottenham pressed home their advantage with a second goal in the 48th minute as Llorente met Son’s cross with a cool close-range effort. Aurier increased the visitors’ advantage in the 55th minute, putting the finishing touch to a fine piece of approach play from Son. Son’s influential display was rewarded in the 57th minute when he raced through the Tranmere defence before slotting home. Llorente had scored only once this season but he was making the most of his rare chance to shine. In the 71st minute, Oliver Skipp’s pass picked out Llorente and he scuffed his shot past Davies and 60 seconds later he scored again, this time turning in Lucas Moura’s cross. There was still time for Kane to dink in his 19th goal of the season in the 82nd minute as he became the joint fourth highest scorer in Tottenham’s history.